ZERO Lumbar Support Ergonomic Office Chair is the new standard in office seating. The most outstanding feature of ZERO Office Chair is the unique Automatic Lumbar Support (ALS) System. 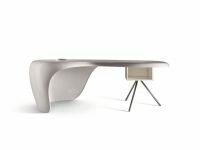 ASL adjusts itself to the user’s shape in order to provide perfect lumbar support from the moment they hit the seat. 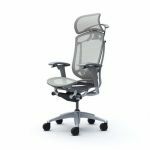 ZERO Lumbar Support Office Chair is a perfect fusion of art and science, with flex zones that ensure constant support of back and lumbar, multi-dimensional adjustable armrests for unparalleled support and a height-adjustable pivoting headrest for full cranial support. ZERO Lumbar Support Office Chair has been designed specifically for those who are in an office chair for long periods of time and require "Intensive Use Seating" for comfort. ZERO BLACK Office Ergonomic Chair with Automatic Lumbar Support (ALS) System. 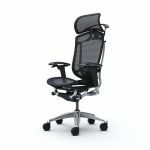 DUE BLACK Full Mesh Ergonomic Chair.